Well, as of last week, I’ve joined the esteemed-blogging-baking ranks of Tuesdays with Dorie, which is a weekly baking and blogging community working through Dorie Greenspan’s cookbook called Baking: From My Home to Yours. I lucked out this week by getting to make one of my favorite desserts: crème caramel (or Caramel-Topped Flan as it’s called in this cookbook). I’m looking forward to playing hooky on a regular basis from the “cooking school” angle I’ve set up for myself. As I learned earlier in this blog about crème caramel, this recipe covers two difficult things in baking: custard and caramel. But, I’m willing to practice both skills in order to get another crème caramel out of the deal! This time, I played around with the recipe and followed the suggestion of using coconut milk, and for my own spin added some ginger juice. 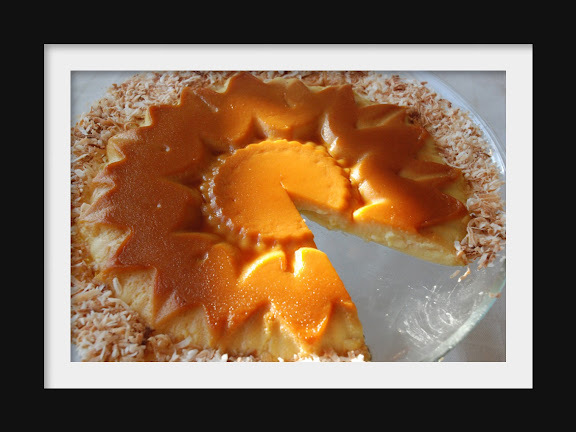 Also since I only have skim milk in the house, I used ½ cup of skim milk and ½ cup of whipping cream instead of the 1 cup whole milk recommended for this coconut flan. I also strained the custard before pouring it into the pan to ensure no stray bits of curdled egg found their way into the flan. Based on the comments from Spatulas, Corkscrews, & Suitcases, I doubled the caramel ingredients. You can never have too much caramel to lick off the plate! And next time I’d even triple it. Also, I thought the addition of lemon juice unusual. I did a bit of hunting, and found that acid in the juice inhibits crystallization of the sugar syrup. Here’s where I found this tidbit. In more research, I found that to avoid a “pale” crème caramel, the caramel should be cooked to 340°F. I also tried baking it in one of my rarely-used, but fun Nordic Ware pans to see what would happen. One of my problems was finding a pan large enough to hold my sunflower pan so that I would have the bain-marie effect. My broiling pan worked, but I was worried I didn’t have enough water to come halfway up the sides, but I did (just barely). The other problem was unmolding. I warmed the bottom of the sunflower pan on a burner on top of my stove and then used a thin knife to get around the edges of the pan, but next time I would try it without the knife since it did some damage to the sides. I thought the trick of heating the pan before pouring in the caramel was brilliant. 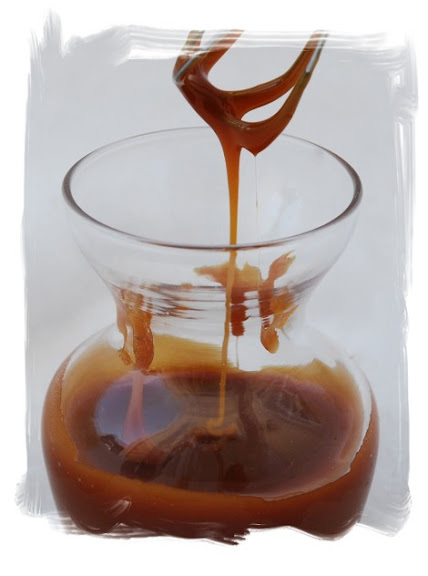 That gives you more time to pour the caramel before it hardens. I made sure after doing this that the caramel hardened before adding the custard, though. You can find the recipe at this blog or in the book Baking: From My Home to Yours by Dorie Greenspan. To see how the rest of the TWD group fared with this week's recipe, click here and then click on each blogger! If there isn’t enough caramel oozing out of your crème caramel, you can always make your own and serve it on the side. Combine the sugar and water. Bring to a boil and cook, without stirring, until the syrup turns a caramel color. Remove the saucepan from the heat. Add the butter. Stir. Add the cream and stir. Serve warm. (Reheat in microwave if desired). Dorie Grenspan’s recipe contains more milk but less eggs, sugar, and vanilla than the original recipe I used, but it didn’t make an impact on the taste. Both flans tasted delicious. However, I didn’t find the coconut (or the ginger juice) flavor was noticeable. 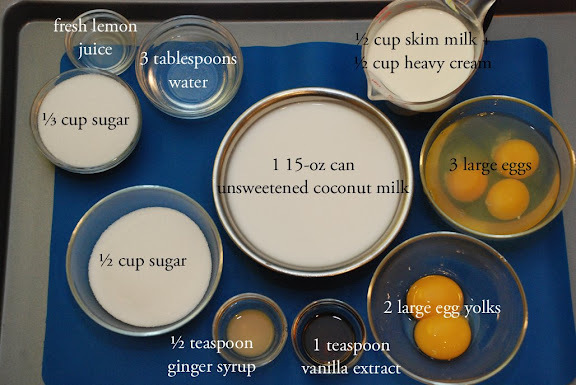 Either I need to add more ginger juice or try steeping the coconut milk with fresh ginger instead). Also, I would triple the caramel part of the recipe. You can never have too much caramel. I might also double the flan part of the recipe if I’m going to use a Nordic Ware bundt pan again since it turned out rather thin. However, I won’t have trouble finishing up this flan since it’s one of my favorite desserts. Wow that looks awesome in that pan!!! What a fabulous idea!! It turned out beautifully in that pan! Lovely ideas! The pan is great, ginger juice - tasty and your extra info, insightful! Many caramel things are made here with lime juice added and I have never known why. Thanks! Quelle bonne idée d'avoir utilisé un moule en relief. A noter pour une prochaine fois. 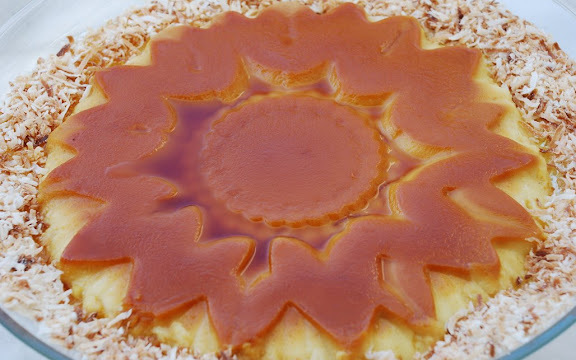 Lovely looking flan! What a beautiful pan! Simply beautiful! You did a great job! It looks fabulous! Simply beautiful! It looks amazing! What a great idea to serve extra caramel on the side! Wow. Your presentation is flan-tastic! Love the picture of all the ingredients. I really need to get better at that. Great job! Love the pan you used. Looks great! Welcome to TWD! Ginger ... now that's inspired. Wish I would've thought about doubling the caramel - oh well. Next time! Ok, I can't stand it ... just what is the bain-marie effect? Having seen all your pictures, I know it must be good!! Your pictures are outstanding btw, but I'm starting to enjoy your experimentation even more. Its amazing that you thought to use the flower pan and add ginger. Super cool. What a beautiful pan! Great Job! I made my flan last Wednesday and I wish I had waited until I heard comments like mine! I would have used triple the caramel too. I thought about making extra caramel to go on the side, but my it disappeared before I could even think about it!